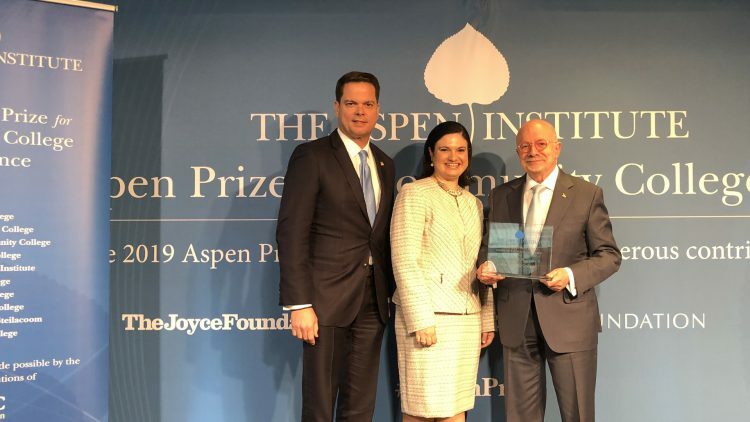 Miami Dade College received the prestigious 2019 Aspen Prize for College Excellence, the nation’s signature recognition of high achievement and performance among state colleges. The announcement was made today in Washington, D.C. The award is considered the highest and most sought after among American colleges. “This award is an affirmation of what we’ve been aspiring to for so many years at MDC, mainly to ensure open access and academic excellence can go hand-in-hand,” said Dr. Eduardo J. Padrón, MDC’s president. MDC, also a 2011 Aspen Prize Finalist-with-Distinction, was recognized for standing out as one of the nation’s top colleges. Through its Student Achievement Initiative and Guided Pathways work, led by Executive Vice President and Provost Dr. Lenore Rodicio, MDC has aligned institutional practices and policies to student success, leading to an impressive overall graduation/transfer rate above the national average, with no attainment gap for students of color, which make up the majority of the student body. The College also has proactive support services to help students address non-academic needs – such as housing, transportation and food insecurity – that would otherwise create roadblocks to graduation. The College’s five-year process redesign plan continues to improve student success and completion. MDC has retention and completion rates that significantly exceed the national average. Moreover, MDC now ranks no. 1 in the state and among the top four institutions nationally in improving the economic mobility of students. “I am consistently impressed by Florida’s community colleges. MDC demonstrates that it is possible to achieve high and improving levels of student success in every measure Aspen weighs, dispelling the myth that community colleges must choose between high levels of student learning and degree completion, or between excellent workforce development and transfer preparation, or between open access and equitable outcomes,” said Joshua Wyner, Executive Director of the Aspen Institute College Excellence Program and author of What Excellent Community Colleges Do: Preparing All Students for Success. Awarded every two years since 2011, the Prize recognizes institutions that achieve high and improving student outcomes, selected from over 1,000 colleges nationwide. Focused solely on student access and success, the Aspen Prize recognizes colleges with exceptional achievements in four key areas: student learning; certificate and degree completion while in community college and after transferring to a four-year institution; employment and earnings rates after graduation; and access for and success of minority and low-income students. The Aspen Institute College Excellence Program aims to advance higher education practices, policies, and leadership that significantly improve student outcomes. Through the Aspen Prize for Community College Excellence, the Siemens-Aspen Community College STEM Award, and other initiatives, the College Excellence Program works to improve colleges’ understanding and capacity to teach and graduate students, especially the growing population of low-income and minority students on American campuses.